While reading do not miss moles planted within the most vociferous opposition party and the moles within us. Like the simile of an onion I have used to frame my hypothesis, the most crucial and damaging is Pakistan’s susceptibility to US interests in chagrin to its short and long-term interests. Whenever a Pakistani leader has shown a flair for independence, he/she has been eliminated. Add to the list Pakistan’s tax evaders, money launderers, political business cartels, offshore businessmen, bad fiscal policies, impotency of regulators, opaqueness in transparency and economic hit-men to make a lethal brew of anti non-state actors. All these layers compliment each other but for the interests of Pakistan. They also coalesce when needed to subdue the winds of change. They exist in every sinew of Pakistan’s politic body. Pakistan has never had a cohesive, self-serving and permanent national policy; a sad but true reflection of a state that spent half its existence under military dictatorships or tailored democracies under the watchful eye. The first decade was lost to political conspiracies hatched by a group of bureaucrats and politicians, who had the advantage but not the conscience of serving with Quaid-i-Azam Mohammad Ali Jinnah. They chose to wade through a muddied perspective on an elusive and unending journey of inventive nationalism that caused disfigurement. To complicate the national construct, foreign policy resulting in subservience to USA set in motion a diplomacy of invisible interventions that often became violent. How intense were US interests in Pakistan that Prime Minster Liaqat Ali Khan had to be assassinated by CIA through the Afghan Government because he refused to destabilize Mossadeq’s regime in Iran begs no answer. Subsequently USA not only changed the regime but also reached a long-term alliance with Saudi Arabia that was to later forge the Oil-Dollar Equation. Pakistan’s close relations with Saudi Arabia and other Arab Kingdoms are imbedded in working within US interests and in the bargain provide a security balance to Middle East. Now that USA is easing its policy on Iran after many decades, Pakistan will be dissuaded across the entire spectrum of policy from placation to violence to keep its relations with Iran in concert with US-Saudi objectives. This shift in Pakistan’s policy was the result of Bhutto’s policy of a greater Muslim alliance through the Islamic Summit. Ultimately it distanced Iran. But Iran too had its hegemonic designs that became aggressive after the Iranian Revolution creating frictions on international border, inside Afghanistan and sectarian lines. Ever since, both neighbors have played a game of brinkmanship with mutual suspicion under the watchful eye of USA and KSA. On his part Bhutto suffered a fate no different from Liaqat Ali through a military dictator groomed to work for US-Saudi Interests. His judicial murder was actually a correction course for Pakistan lest it became too independent and powerful.What did Bhutto do to merit such a cold-blooded end? The answers lie below. First, he rebooted Pakistan’s nuclear program towards weapons. Bhutto envisioned a nuclear Islamic block strengthened by the oil wealth and Pakistan’s skilled manpower. However, his left leaning policies were viewed with suspicion by his Arab allies. Bhutto had a long-term vision for his country but his economic plan backfired. To put Afghanistan under pressure he supported the Afghan Student résistance against Sardar Daoud. The pressure worked and Daoud was ready to sign a permanent deal on Durand line. Days before the two heads of states were to formalize the agreement; Bhutto was overthrown by a military coup. The military regime never pursued this agreement. Bhutto proving too big for his boots was made an example. Bhutto’s erstwhile military chief and his executioner fared no better. The military takeover in 1977 served US interests and infused permanent seeds of internal instability in the form of weaponisation of society, drugs, militant organizations, intolerance, sectarianism and religiously inspired violence. The mock Afghan jihad lasted as long as it served US interests and was conveniently relabeled as the invisible floating threat of Islamic terrorists. USA was suspicious of Zia’s growing nuclear cooperation with China. He had to go and so did that fatal flight on C-130. The daughter of the East returned to Pakistan with a thumping popular applause. But also attached to her Bhutto symbolism was an ill matched spouse willing to cut her to size whenever she over grew. Her spouse through his corruption twice got her governments removed. Yet within her limitations of working with many uncles, new entrants and a dubious husband, she never gave up her father’s vision. The nuclear program progressed to perfection including the weapon testing sites in Chagai. Then began the pursuit of delivery systems and their indigenous production. She continued to pursue the Afghan policy of her father. By 1996, Mullah Omar had agreed to the international demand of a broad based government and also signing the Durand Agreement. A day before she was poised to sign this historic accord with the new Afghan broad based government, President Laghari mysteriously sacked her government. Neither the interim not the subsequent PMLN government pursued this historic opportunity. To her credit, Benazir never lost heart. After 9/11 she almost engineered the handing over of Osama Bin Laden to Turkey, a NATO country. USA refused. Then she returned infused with an elixir. She had made some of the most critical decisions of her life; amongst them to team up with Musharraf to make a formidable Pakistani team and secondly to shed off her yoke. As per her terms of agreement with USA, Nawaz Sharif was to serve his time of self-exile in KSA. She rejected the NRO. The daughter of East had become too hot to handle. Though her fire is seemingly extinguished, it is in the interests of Pakistan that the pyre must burn. Musharraf’s exit after her death and subsequent humiliation were writings on the wall. Zardari became the heir to the political dynasty through a controversial Will. So what does this entire ongoing drama in Pakistan mean? If precedence is to be followed, it is all hallow and the birds of feather will flock together. These agents of instability are well placed in every system, organization and political party to allow a departure towards an independent Pakistan. Even if some amongst them wish contrition, they will be ruthlessly cut to size. Like a conventional current on a boil, everything must go down for a new to begin. Wherever we find treachery, we will find Aitzaz Ahsan. We can’t look at this as a political crisis anymore. These traitors, snakes and swines cannot be left as they are. Today’s shameless and disgusting session in Parliament made it damn clear that Ghazwa-e-Hind has been launched in Pakistan by Khawarij and Indian pigs! Here’s what I found most shocking: TUQ, IK and Luqman all hailed Aitzaz Ahsan’s blasting of NS. Are we that stupid and shallow that we can’t see the most dangerous RAW agent and hail him as a “nafees” and “honorable” Pakistani? At least Diesel, Zardari, JI, and Achakzai are unleashed and obvious ghaddars. But AA is the definition of a snake, more dangerous than Zardari and needs to be exposed. He’s a mastermind behind legal, political, economic, media, cultural and ideological strategies to undermine and destroy Pakistan’s interests. I have enclosed a few links that you must watch and share across social and mainstream media. 2. 10th India Conclave – BJP Terrorist Subramaniam, Aitzaz Ahsan and Khawarij Maulana Mahmood Madani. Listen to Subramaniam open his speech by declaring Islam as a terrorist religion, saying that all Muslims and Christians must declare that they are originally Hindus, otherwise face a religious war and call Pakistan an Islamic Terror state. listen to Aitzaz Ahsan’s pathetic and apologetic reply to the mushrik. In his acknowledgement, in the 2nd Edition, Aitzaz Ahsan mentions the efforts of M.J. Akbar and a Pramod Kapoor, both from India, who helped him draft this new edition. As one reads it, one understands why; because, though the book outwardly is on entity of Pakistan yet it portrays the theory of epic Mahabharta. four pages as the preface and a twenty three page introduction, where Aitzaz writes of fragile state of Pakistan by quoting Ziring 2 ‘Pakistan could cease to exist in its sovereign nation-state form’ and then quotes Tariq Ali from his book ‘Can Pakistan Survive?’ and Shahid Burni, a director of World Bank, ‘only time will tell whether Pakistan realize its potential or be over whelmed by its problems’ He also cites a Tahir Amin of Q.A. University ‘The Bangladesh syndrome continues to haunt the Pakistani decision-makers, who fear the ethno-nationalist movement of NWFP, Sindh and Baluchistan may also follow the precedent set by Bangladesh movement’. And now he applauds the figure of Jawaharlal Nehru, who expounded the theory of Mahabharta, of one-ness of India and refers to his book3. Aitzaz, equates his jail experiences with that of Nehru and appreciates his vision of unity of India and mentions the centripetal pull of India, a supernatural force that could again pull Indus region to itself! In Section-2 of the Introduction, Aitzaz brings forth the theme of one-ness of Bharat or the epic Mahabharta. He appears obsessed by the theme of Mahabharta and either by design or ignorance, this modern day champion of Indus does not enlighten us that the concept of a mahabharta is actually a concoction of the fertile Hindu Brahman mind. “the epic mahabharta, in describing that great pre-historic civil war not only unquestionably, assumes the ‘oneness’ of the vast subcontinent, but also books upon the lands of Bactria (Balkh) and China, beyond its great mountains ranges, as outlying frontier regions, inseparable, inalienable and natural parts of the Indian subcontinent. The concept of the ‘unity and indivisability’ and of one vast and limitless subcontinent, itself the size of all of Europe, is thus ancient and rooted in historical mythology”. Then Aitzaz gives the geographic boundaries encompassing oneness of India and a common Indian race and refers the same to Jawaharlal Nehru and also quotes other proponents of Indian oneness 6. Building up the case of a greater India, the apt and able lawyer in Aitzaz now pauses in his graphic description of an akhund-bharat and returns to his earlier theme of the Indus Saga i.e. Pakistan’s creation. In Section-4 of the Introduction, he again reverts to his oneness of India obsession. Though he outwardly laments that, our historian continues to style the variegated and many-faceted history of Indus as an integral part of what is called ‘Indian’ history. And further woes that our historian, though focusing on Indus history pay more attention to the rule & influence upon it of the Indian dynasties, and also bemoans – that our historians in order to give entity to Pakistan, trace our cultural foundations solely to extra-territorial linkages, meaning thereby, the Arab, the Persian & Turk. And Aitzaz claims, that in denying the Indian they deny theIndus and hence the break from the many attributes of Indus culture which are common to the Indian. In Section-5 of the Introduction, he deals with , what he calls, the battered soul of Pakistan and professes it is time to rediscover and restore the soul, the dream embodied in it, and to rediscover and restore Pakistan as a liberal progressive, modern state, and hence through this quest of Pakistan, he wants to create a secular Pakistan, and then merge it in the oneness of India as is the theme of the work disguised as a peace move. In Section-6 of the Introduction, Aitzaz refers to a generation bridge covered by his three points – first being poetry to illustrate a point – by quoting on P-35 of his book a Rig Vedic hymn in praise of a horse. The apparently insignificant Horse has a very important role in this subtle war of indoctrination by the Brahman designs. In Section-8 of the Introduction, he names the main eleven Indus men 4 who are his heroes of Indus. Aitzaz gives his own concept of Pakistan’s Past, Present & Future, by stressing on P-17, “they cut us off from our heroes, but the questions and our heroes have survived, they must survive. Pity the nation that forgets its heroes. We have to rediscover our heroes. Until we do so, many cancerous myths will continue to harbour in our body- politic, and many unwanted fractious controversies and fissiparous tendencies will continue to divide us”. According to Aitzaz, we were never fighters and he starts our past from the time when Hindus came and made us Puru’s and under their leadership, we became a fighting force! Aitzaz Ahsan grieves on the theme ‘six decades on, there is hardly an Indian, even the must accommodating and rational, who does not privately resent the partition of 1947. Even the most congenial Indian, Hindus and Muslims will say with love and affection,’how much before it might have been if…….” If the partition should not have taken place? jab Khadim e Alaa should become Nadim e Alaa and resign immediately!! THIS KASHMIRI TOLA WILL HAVE TO PAY FOR THEIR DEEDS. The following message is being circulated on the Internet that reveals the truth about General Musharraf. I am passing on the message because I agree with it. I hope that the political class will take note that they are next in line and that the segments of the media and the judiciary are complicit in actions and statements that direct the wrath of the nation from the person of Musharraf to the institution of the armed forces. No foreign power can hurt a country as long as the armed forces are effective in their statutory role of defending the country and enjoy overwhelming public support in that role. The military can and does impose its will when policy makers are acting treacherously. Musharraf made a lot of mistakes which come in the category of misjudgement. But Asif Zardari acted treacherously at least on two occasions. One, he put the nuclear deterrent of Pakistan on sale and publicly said that a 100 billion dollars would be acceptable. Israel publicly recommended that the USA accept the offer. Two, the Memo he sent through Hussain Haqqani to the USA offering a deal to accommodate US concerns on Pakistan’s nuclear deterrent in exchange for an overhaul of the military command in the name of ‘CIVILIAN CONTROL’, to make Asif Zardari the like of Saddam Hussain and Hosni Mubarak as the ‘emperor’ of Pakistan on the lines Hasina Wajid is being entrenched by India in Bangladesh. 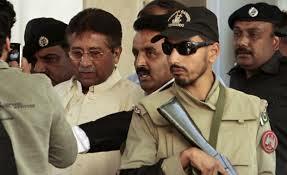 Musharraf is in custody today. A fall from grace indeed! This is natural justice for the mistakes he committed during his rule. I see the media, the politicians and the judiciary asking for his head — the same people whose heads should also roll if the Constitution is applied to them! This is the irony. For the sake of putting on record the facts, I am writing this. Those who trust us will know the facts. Those who do not trust us can disagree. Musharraf is a patriot who chose his allies and advisers very badly. He was destroyed by Shaukat Aziz, Tariq Aziz, Altaf Hussian and the PML(Q) which were his allies. Today, they have all abandoned him. This happened as he chose the corrupt, the Qadianis, the enemies of Pakistan and opportunists as advisers. He may have been a brave soldier, but he was very naive in politics and poor in religion. He was still a patriotic Pakistani. We must be fair to him. But his actions harmed Pakistan just as Zardari’s actions and CJ’s decisions are harming Pakistan today. Both Zardari and the CJ would also meet the same fate which Musharraf is facing today. Musharraf is guilty of following crimes: These are indeed major crimes that have had lasting consequences. 1. NRO, which imposed upon hapless Pakistan this bunch of crooks in the name of democracy. Those who ruled Pakistan for the last five years were not only l corrupt; they are traitors ho opposed Pakistan at the time of its creation or have been recruited by hostile secret agencies since. The same NRO is haunting him as he sits alone in a Police rest house in Islamabad . 2. He allowed the proliferation of electronic media without ensuring that control did not fall in foreign or hostile hands. The TV channels are now openly owned by corrupt media moguls who employ known subversives as anchors and get their objectives and propaganda line from foreign funded – mostly by Indo-Zionists – who work to destabilize Pakistan and sown seeds of discord and conflict. Now the same media is skinning him alive. 3. He resurrected and reinvigorated the MQM, which had almost died in 90’s. Now they are a huge monster haunting Pakistan . 4. He allowed the CIA to create TTP, offering Pakistan land to NATO unconditionally to supply weapons for terrorist and separatist groups like TTP, BLA and MQM. Thousands of “Raymond Davis” were allowed into Pakistan to wreck havoc with Pakistan ‘s security. 5. Destroying Pakistan ‘s ideology, Islamic values and moderation to patronise “western liberal secularism” in the name of ‘enlightened moderation’. This created extremism – both left and right – that has polarised the society and helped sustain murderous strife. Islamic values and faith has taken a serious hit in this period. The above are just a few important ones. 1. He or the army did NOT kill Akbar Bugti. That is a lie. Bugti was killed as the roof of the cave he was hiding in, collapsed. Details of the incident have already been discussed many times. 2. Musharraf did NOT kill Benazir Bhutto. That is a lie as well. BB was killed by the TTP. That has been confirmed by every investigation agency that looked into it. 3. The case of Lal Masjid is not so clear. It was confirmed that the TTP used it as a terrorist den. The use of force may have been excessive and opportunity for a negotiated resolution spurned recklessly. But the Khawarij rebellion – whatever its scale or form – has to be put down firmly with force. A case or FIR cannot be registered against the Pak army (the Army Chief or the President) or the Police on internal security duties or conducting an operation. This is abuse of law and a blatant violation of rules. Musharraf was the President just as Zardari is the President today. 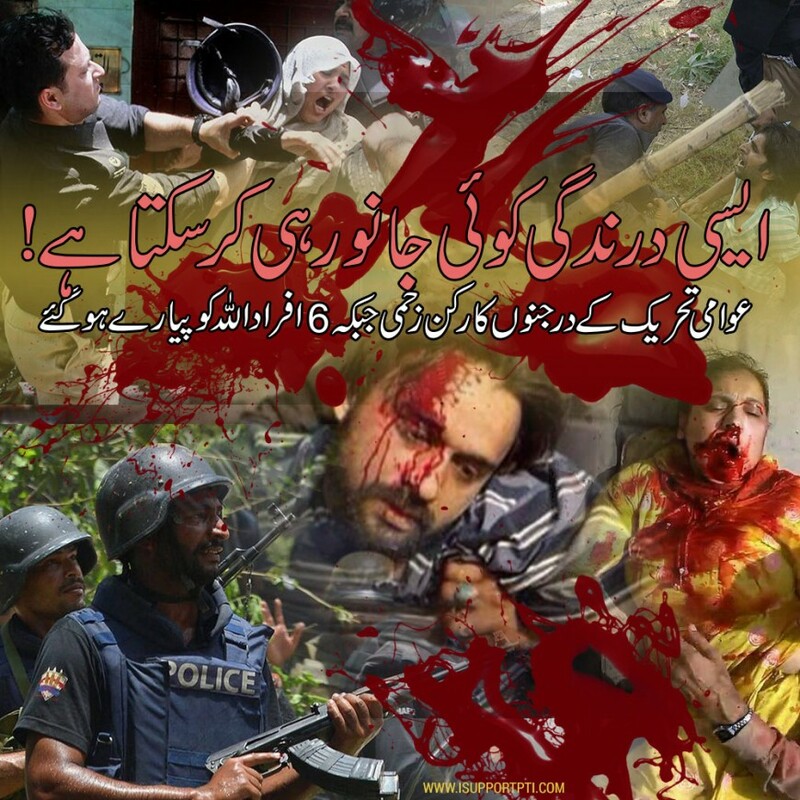 Are we registering FIR’s against Zardari or the PM for all the violence going on the country? NO! Then how can FIR be registered against Musharraf for Bugti, Benazir or Lal masjid? Would that not be Target killing through the judiciary? He is a victim of his own bad decision, treacherous allies, and self-serving advisers and the ‘free media’ he is so proud of freeing. The present rulers including bureaucrats and judges should learn a lesson. Their fate is also going to be the same to the extent as they act as tools of foreign intelligence to destabilise Pakistan today. May Allah (swt) protect Pakistan and its people from the fitnah created by misuse of power, wealth and status, and arrogance of the undeserving.